Hey every one (: NEW UPDATE!!! Re: Hey every one (: NEW UPDATE!!! I lovvve the new look and background theme you did of jesse and I lovvve the phrases "Welcome to the Jmac Family" and We hope to adopt you! You are right we are big family on here! I lovvve you too girl!!!! 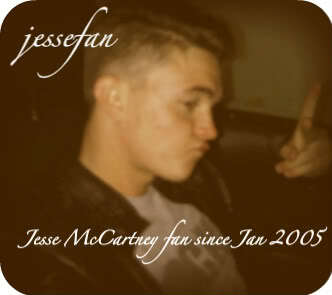 Quida411 wrote: I lovvve the new look and background theme you did of jesse and I lovvve the phrases "Welcome to the Jmac Family" and We hope to adopt you! You are right we are big family on here! I lovvve you too girl!!!! "Quida411" quote- I thought the videos was awesome!!!! You welcome and I will tell people who I know about the forum so they could join! xoxo Btw, I prayed for jesse this mornin' and asked God to watch over him where he goes, show him his compassion, love, forgiveness of his sins, grace, mercy, goodness and everything thats great about him! I prayed for his sister Leah and brother Timmy too, and Ginger and Scot! I thanked God for Jesse and his amazing voice and I love him so much! I told God everytime I listen to his voice it leaves me speechless, its so natural, its beautiful, its heaven to my ears and keeps me sane, and he is my favorite actor, singer, and dancer and my dream is to meet him someday and I believe God will make that happen. Then I told God that even if I don't get the chance to meet him, he will always be in my heart! I also told God that I'm addicted to Jesse voice! Awwwww Thanks and You Welcome! Btw, I just got done listening to Jesse "Departure Recharged" album! I lovvve it!!!! Jesse is defintely working hard and his accomplishing everything! I can't wait to his new album "Have It All" comes out later this year! So I can get get it! Btw, I seen one your Fan Story video of Jesse and I seen that you got to meet him in '05! You are blessed to have met him then! Do you know when Chernobyl Diaries is coming out on dvd? Well, ttyl too and I can't wait to read more of Count Your Blessings: The Next Generation! hi! i really love the new layout also for this site! the colors and everything are awesome amp! thanks a lot for keeping this site running for the fans! we appreciate it very much! i hope you get more help with it too! good luck! I LOVE THE NEW LOOK!! You've done a great job!!! I'm loving the blue theme! !